December 21, 2017, 12:05 p.m. The stop motion/animation hybrid ad features a young girl who is practising for her school talent show. Despite her attempts to get her father to pay attention to her, he appears to be too busy to notice. Or so it seems… As the talent show rolls around, the little girl gets stage fright and can’t remember her dance moves on stage. Her dad proves he has been paying attention all along by getting up and reminding her of her sequence, and she is then able to perform her dance as she’d hoped. 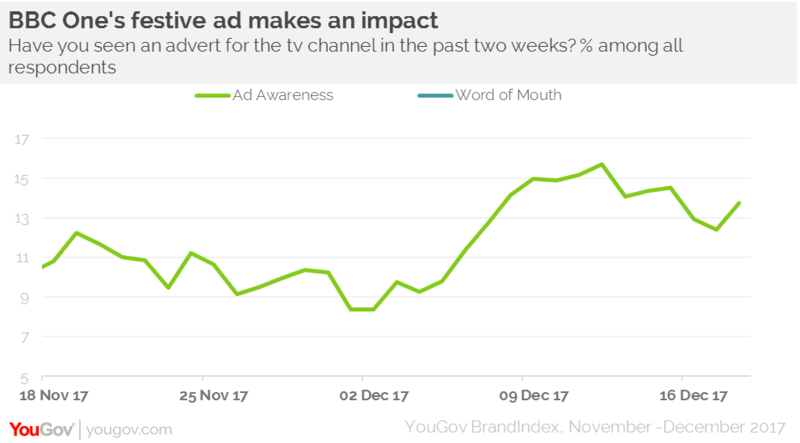 YouGov brand tracking data shows that BBC One’s heart-warming ad has been successful, achieving a six-point improvement since it was released on 2 December, moving from nine to 15. Notably, among those who say they would consider watching BBC One, its ad awareness rises to 20 from 11. This increase in ad awareness also coincided with a rise in word of mouth exposure score (whether someone has talked about the brand with somebody else) which has moved from nine to 13 among all respondents. Of course, the BBC, like other traditional broadcasters, has come under pressure from streaming services such as Netflix. This high-profile campaign is one part of its strategy to remain competitive in a changing media landscape along with its move to add several favourite BBC titles to its iPlayer service over Christmas. Our data indicates that the campaign has helped to engender the same sort of feeling for an advert that is usually reserved for high-profile emotional efforts such as those of John Lewis and Marks and Spencer. The BBC’s television arm will be hoping it can harness this good feeling – and enjoy a strong festive period.